This week is going to be a little strange as far as my Pixar reviews. I am going to be seeing Inside Out tomorrow along with the animated short Lava. This means I will have both of those reviews out of order (I’m not waiting to post about it! There’s no way!). So I will post about One Man Band today and then Inside Out tomorrow and maybe Lava depending on how long it takes me. Definitely by the end of Wednesday (I also have to make videos at the same time. Phew!). I have watched Cars but am not sure when I will post about it. So just bear with me friends as we are a bit out of order this week! 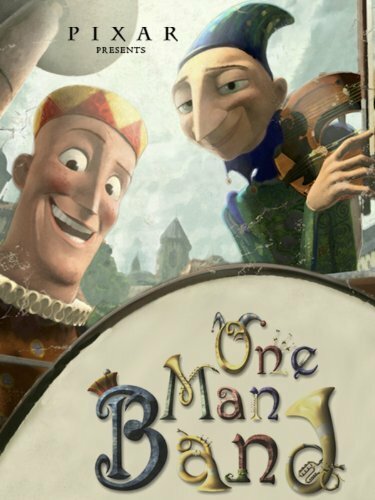 One Man Band is a Pixar short with a ton of charm and some similarities and differences to the previous shorts. I must admit to be a little let down after Boundin’ had narration to get another short that feels like a silent film. It’s very similar to the rest of the Pixar shorts in that regard. It also has a similar plotline to For the Birds and Knick Knack where the cocky guy (or guys in this case) gets their just rewards in the end. So in that sense it isn’t very creative. But in another sense it is creative. It is the only second short using human characters and the first to be set in the past (Medieval times). It also uses music the most effectively (as an actual character in the story) of any of the shorts. The music is written by Michael Giacchino who would go on to do the music for Incredibles, Ratatouille, Up, Cars 2 (and the recent Jurassic World). I think it is one of his best arrangements. In the sound design it reminded me of Tin Toy which also features a one man band but in the form of a toy. One Man Band is about a little girl who is going to put a coin in a fountain and make a wish. She then see’s a man who has a one man band he is carrying around. This includes a tuba, piano, drum, clarinet, and more. He of course wants desperately for the girl to give him the money instead of throwing it down the fountain. But just as he is about to get the coin we hear the sound of a violin. The little girl looks around and see’s another One Man Band guy who’s get up is more strings oriented with violins and other instruments. I’ve never seen a one man band like this before and it is very fun especially when all the violins expand and play. This guy seems a little more cut-throat than the other one who is more good natured. I like how the guy is literally inside the mandolin (or whatever that instrument is). The two start battling each other with music to try and win the little girl over and get her coin. This is just amazing sound work and music as it isn’t just a jumble of sounds but 2 distinct ‘bands’ battling it out. It is never in doubt what sound is coming from which man. Naturally as is the case with most competition things get a little out of control and they end up making the little girl drop her coin and she becomes angry. It’s really cute. Well, it turns out our little girl might not be as hard up as we thought and she has a whole bag of coins and she makes her will known throwing coins in the fountain and making the men chase the coins. 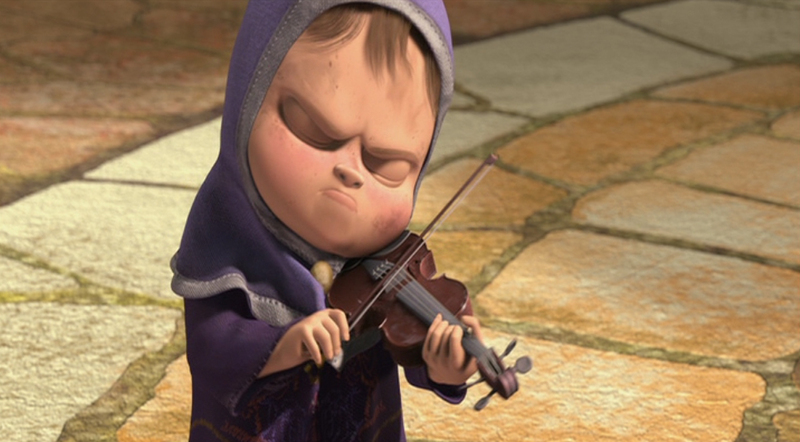 It turns out she can even play the violin pretty well too. So like I said there are some things about this short that make it very excellent- mainly the sound mixing and music. They are first rate. 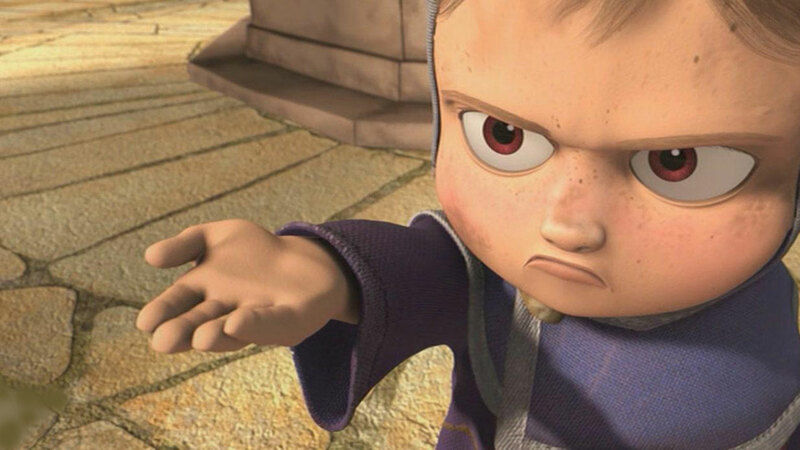 It also looks fine and has some of the clearest humans Pixar had done (look at the knuckles and wrinkles on the finger of the girl. She is much less pasty than other human characters Pixar had done). As most of the short is about music, it being the strength means the short is pretty good. And it is a very funny cute little story. I guess I just wish there was dialogue or a narrator more of a story like we saw in Boundin’, but it is still an entertaining short, which will make you smile. So ready to go to Inside Out! I can hardly contain my excitement! Something about this short, maybe the girl herself, reminds me of the Disney short about The Matchstick Girl.